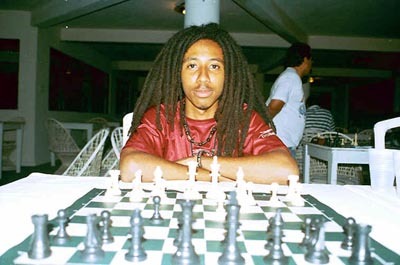 Bertram Scott, "National Master-Elect: Ras Malaku Lorne," Jamaican Ambassadors Chess Academy." Candidate Master Ras Malaku Lorne came to the 2003 Jamaica Open in Montego Bay needing just a plus score to confirm his National Master title. The young Ras played spirited chess to finished 3rd to Open Champion FM Warren Elliott (5/6) and Jamaica Champion NM Shane "The Magician" Matthews (4½/6). National Master Lorne scored 4½/6 with three wins, earned a draw with FM Elliott, and suffered a lost at the hands of "The Magician". In the quest to crown Jamaica's first homegrown International Master (IM), and ultimately the first local Grand Master (GM), JACA warns that the long road to both elusive titles will pass through the mind and board of National Master Ras Malaku Lorne. "Mala" may also be the first Rastafarian NM in the World. Editor's Note: John Tobisch, who has served as Lorne's coach, was perhaps the happiest of all. From time-to-time, he would send me e-mail praising Malaku and providing details of the training regiment. Often coaches are overlooked for the deeds of raising strong players. The Chess Drum would like to salute coach John Tobisch in his fine efforts in helping to produce Jamaica's newest Master!